1. Put chocolate and the 1/2 cup butter in a heatproof bowl and set over a pan of simmering water and melt, stirring often. While your chocolate butter mixture is cooling, butter a round 9″ x 2″ pan and line with a parchment circle then butter the parchment with the remaining 2 tbsp. of butter. 2. Separate the egg yolks from the egg whites and put into seperate bowls. Put the sugar and puree in with your yolks. Whip the egg whites in a medium-large grease free bowl until stiff peaks are formed (do not over-whip or the cake will be dry). With the same beater beat the egg yolk mixture until pale in color and has some volume. 3. Add the yolk mixture to the cooled chocolate. Fold in 1/3 of the egg whites into the chocolate mixture and follow with remaining whites. Fold until no white remains without deflating the batter. 4. Pour batter into prepared pan, the batter should fill the pan 3/4 of the way full, and bake at 375° F. Bake for 25 minutes until an instant read thermometer reads 140°F. 5. Note – If you do not have a instant read thermometer, the top of the cake will look similar to a brownie and a cake tester will appear wet. 6. Cool cake on a rack for 10 minutes then unmold. 1. Combine puree and sugar in a heavy medium saucepan. 2. Scrape seeds from vanilla bean and add both to the saucepan. 3. Stir over medium heat until sugar dissolves. Simmer until mixture has reduced to 1/2 cup, stirring frequently, about 5 minutes. 4. Remove bean then transfer coulis to bowl and refrigerate until cold. 5. 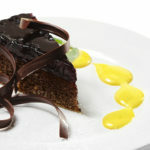 Drizzle coulis over cake just before serving.